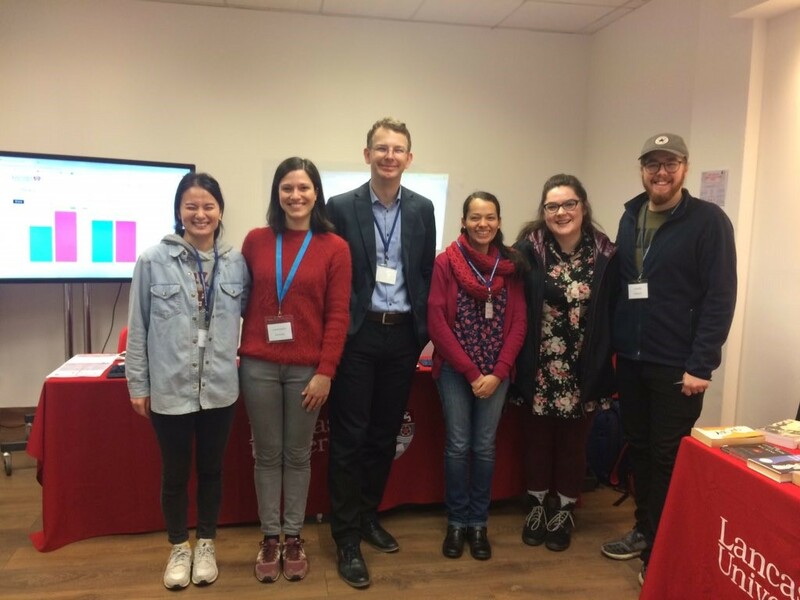 Last Saturday (9th March) a group of students led by Vaclav Brezina and Dana Gablasova took part in the Campus in the City event, organised by Lancaster University. The main aim of this event is show research highlights to a general audience. 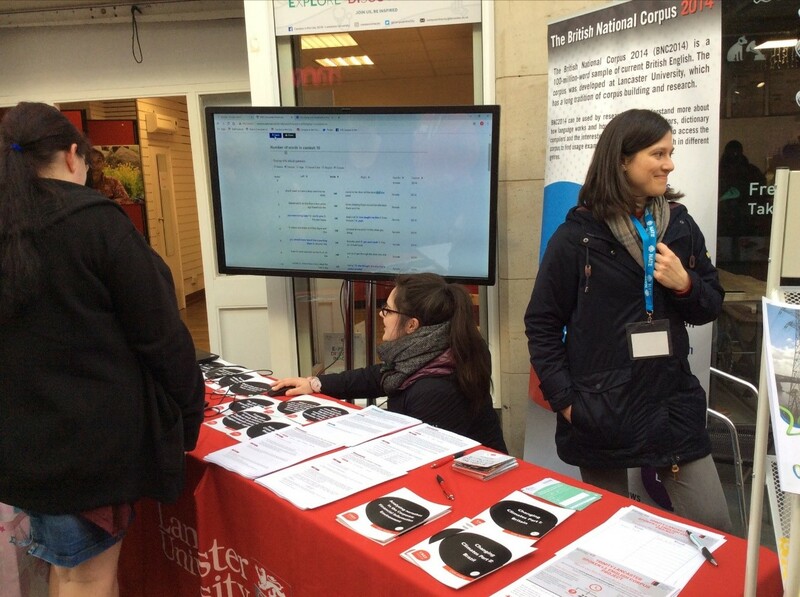 So, we decided to bring corpus linguistics to town and show anyone who would be interested that searching corpora can be fun. And of course that it can also tell us something very interesting about language and society – something we all can relate to to some degree. From the left: Yejin Jung, Raffaella Bottini, Vaclav Brezina, Irene Marin Cervantes, Lorrae Fox and David Ellis. We arrived in the morning to St Nicholas Arcades, a shopping area in the centre of Lancaster, to set everything up. It was pouring with rain and our initial hopes and expectations were fairly low. But we prepared our computer tools, worksheets, CASS briefings etc. and were awaiting the first people to arrive. One large TV screen connected to a laptop on which people could search a spoken corpus using BNClab, a keyboard and a mouse. We also had a parallel set up with a data projector showing the search results on a wall – we were ready. From the left: David Ellis, Raffaella Bottini, Lorrae Fox, Yejin Jung, Irene Marin Cervantes and Vaclav Brezina. The weather improved and many people came along. They searched for words and concepts, tapping into different corners of social reality, areas that were of a particular interest to them. 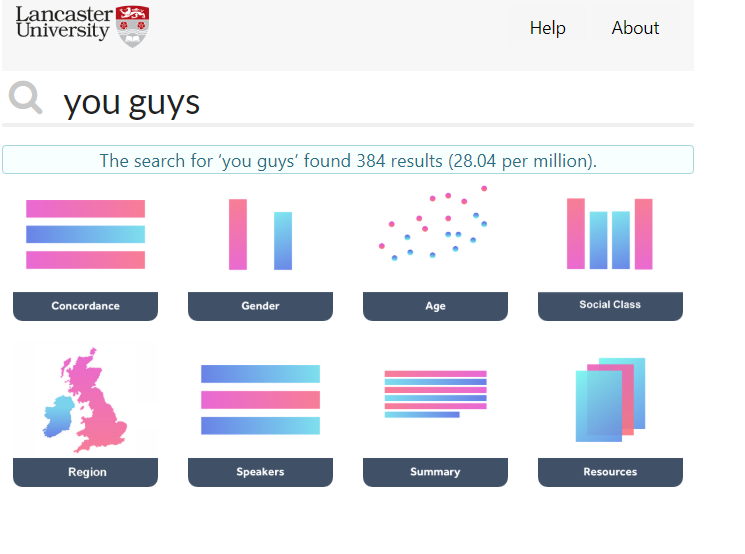 The reward for a few minutes spent with corpus linguistics was in the form of graphs, maps and examples of how the words of interest are used in the UK by different social groups based on gender, age and socioeconomic status. Vegan, chav, please, colour, climate etc. were among the words searched. The day went by very quickly but the highlight came at the end. Our youngest participant, a seven-year-old girl came along with her mum. With a bit of hesitation she started typing words: pokemon, Pikachu – we’ve never thought about these words ourselves so it was a pleasant surprise for us to find out that the spoken corpus indeed included 4 and 21 examples respectively. The budding corpus linguist started beaming. Many other words followed: Brownies, kitty, cat, rainbow, Disney etc. She searched and navigated through the system with such an ease that she would be almost ready to start a university course in corpus linguistics. The day thus finished for all of us on a high point. 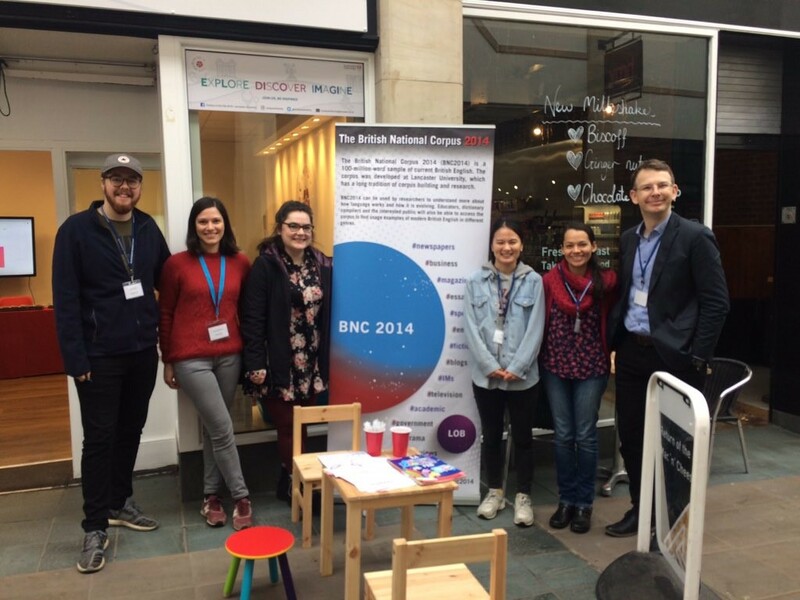 There is one more session of the Campus in the City with BNClab. Come along on 22nd of March from 11 to 3pm if you want to talk to us and try some searches. Acknowledgement: This event was supported by the ESRC grant no. EP/P001559/1. This entry was posted in Blogs, BNC2014, Events by Vaclav Brezina. Bookmark the permalink.